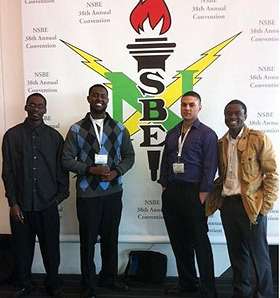 At the end of March, junior physics majors Gottlieb Uahengo, Mohamed Sheikh-Mohamed, Amir Rose, and Fred Vedasto attended the National Society of Black Engineers (NSBE) conference in Pittsburgh, Pa. The conference included workshops and programming for grade school, collegiate, graduate, technical professional, and international entities of the Society. Their travel was funded through the NorthStar STEM Alliance, an initiative funded by the National Science Foundation (NSF) which is intended to double the number of African-American, Hispanic/Latino, Native American, Alaska Native and Pacific Islander students receiving baccalaureate degrees in science, technology, engineering, and math (STEM). Below three students reflect on what they experienced and learned at the conference. Firstly, I would say if anybody had an opportunity to go to a place where there will be recruiters in their professions, they should go. From this trip, I connected with many companies, and one thing that shocked me was that the CIA was recruiting at the career fair. I always thought that they hire by invitation only, but it changed what I believed about it. I learned that with age comes wisdom, so I asked every professional individual that I had a conversation with, “What advice do you have for young guys like us?” The majority of their answers were to look for internships and co-ops because if companies like you while you with them, they will try to hire you as soon as you graduate. They also said that most companies look for diversity and something new that they do not have in the company, so if you have something new to contribute to a company, give it a try and apply for that company. They are also looking [at students who have been in] leadership roles. This trip really helped me, knowing that there is a high demand of engineers in the upcoming years and almost every major company and corporation needs an engineer of some sort on their team. The 38th Annual National Society of Black Engineers was an exciting conference to attend, because it provided the opportunity to observe and participate in critical scientific discussions. There was a multitude of organizations ranging from graduate school programs, multinational companies and various government agencies. The setting was most welcoming and encouraged young African-Americans to participate in the sciences so to better understand the importance of engineering as a multilateral discipline. The atmosphere was further re-enforced by the large number of multinational companies, showcasing their products, technology, and the innovative solutions they have developed to solve pending problems. I was particularly intrigued by my ability to draw several parallels between my Augsburg education and some of the physics behind the technology of companies such as Boeing, Lockheed Martin as well as Minnesota native 3M. This realization brought a sense of deep pleasure, as I was able to see real world applications of the many concepts I have studied in my classes. I also attended some workshops during the conference. A workshop hosted by Space (titled “Restoring American Human Spaceflight”) in which the audience participated in an interactive discussion on the importance of space exploration and its implication to the survival of the human race. I gained a great wealth of knowledge from this workshop as one could sense the depth of knowledge present throughout the room, simply from the ideas and questions that arose during the workshop. We discussed the implications of space exploration and its wear on the astronauts’ health and how these issues could be resolved by the fast growing biomedical engineering field. Such a possibility would allow ease in not only monitoring astronaut health but also pave a way for remote health operations and effectively allowing any trained individual to perform medical procedures in space. The thought of human life outside earth has intrigued scientists the world over, yet as we begin to wrap our collective knowledge around the laws of the universe, we realize more and more that there are still many unexplained anomalies; one should be humbled by the youthful nature of our technology and what more we have yet to discover as well as its impact to life as we know it. Aside from being mentally stimulating, the conference also provided the opportunity for students to bounce ideas off each other. I had several talks with experts and fellow students, who shared brilliant ideas and journal articles. This kind of environment is surely priceless and one that will drive innovative solution for the future. This invaluable experience would not have been possible without the hardworking and dedication of LSAMP’s “Godmother” (Prof. Rebekah Dupont) who has continually challenged us to excel and apply ourselves. For myself, going to college has never been anything less than mandatory. I’ve always aspired to further my education in the field of science, physics, and engineering. Attending the NSBE conference this spring helped me grasp a better understanding of what life is like after college for an engineer. The vast amount of fields available in this profession span across a large spectrum of interests from automotive, aeronautics, medical, and many more. Attending the career fair was a great experience because it gave me the opportunity to speak with people who have been in engineering for many years and to obtain some good advice on how to approach future jobs and internships. I had the chance to speak with a man who worked for Honda for over 15 years and had gained a great deal of experience in various subsets within the company. Engineering does not only encompass one position, as he explained, [when] entering the company people have a choice whether to do design or manufacturing on vehicles. I thought this was very interesting, and it gave me a new perspective on all of the possibilities available to me after I graduate. Overall attending the NSBE conference was a great experience, and I hope to attend again next year. It gave me a greater understanding of what I can do with my major and made me eager for all the future possibilities that await.